This is a church I seem to revisit every five years or so, and I'm always left wondering why I don't come back more often. 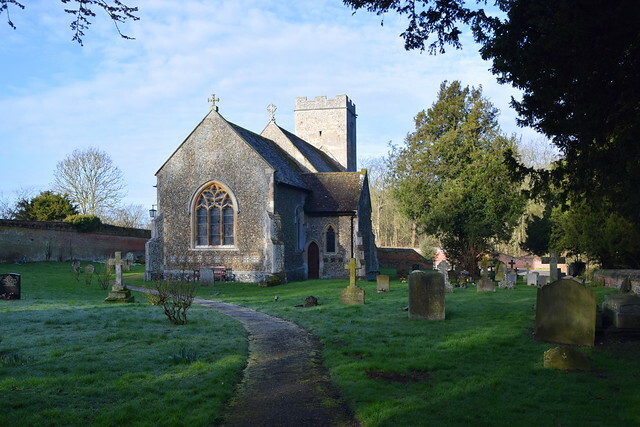 After the longest winter I can remember, and a good five months since my previous church exploring bike ride, I set off from Bury St Edmunds on a bright, cold Saturday morning towards the end of February 2018, and Great Saxham was my first port of call. Nothing much had changed. A large oak tree had fallen near to the fence of the park in a recent storm, but otherwise it was exactly as I remembered. It is always reassuring to cycle off into rural Suffolk to find that England has not entirely succumbed to the 21st Century. But Suffolk has changed in the thirty-odd years I've been living here. There is hardly a dairy farm left, and not a single cattle market survives in the county. Ipswich, Lowestoft, Bury, and even the smaller places, are ringed by out-of-town shopping experiences, and the drifts of jerry-built houses wash against the edges of nearly every village. But the countryside has always been in a state of perpetually change, a constant metamorphosis, and often a painful one. I had been struck by this before while cycling across this parish, and the memory added a frisson to the experience of coming back. For many modern historians, the 19th Century finished on August 4th 1914, and you can see their point. That was the day that the First World War began, and the England that would emerge from the mud, blood and chaos would be quite different. A new spirit was abroad, and rural areas left behind their previous patterns of ownership and employment that were little more than feudalism. Suffolk would never be the same again. No more the Big House, no more the farm worker going cap in hand to the hiring fair, or the terrible grind to keep at bay the horrors of the workhouse. I think of Leonard, remembering the pre-war days in Ronald Blythes Akenfield, that passionate account of a 20th century Suffolk village, Charsfield: I want to say this simply as a fact, that Suffolk people in my day were worked to death. It literally happened. It is not a figure of speech. I was worked mercilessly. I am not complaining about it. It is what happened to me. But the men coming home from Flanders would demand a living wage. The new world would not bring comfort and democracy overnight, of course, and there are many parts of Suffolk where poverty and patronage survive even today, to a greater or lesser extent, but the old world order had come to an end. The Age of Empires was over, and the Age of Anxiety was beginning. The English have a love-hate relationship with the countryside. As Carol Twinch argues in Tithe Wars, it is only actually possible for British agriculture to be fully profitable in war time. In time of peace, only government intervention can sustain it in its familiar forms. Here, at the beginning of the 21st century, British farmers are still demanding levels of subsidy similar to that asked for by the mining industry in the 1980s. With the UK's exit from the European Union looming, the answer from the state is ultimately likely to be the same. British and European agriculture are still supported by policies and subsidies that were designed to prevent the widespread shortages that followed the Second World War. They are half a century out of date, and are unsustainable, and must eventually come to an end. But still sometimes in Suffolk, you find yourself among surroundings that still speak of that pre-WWI feudal time. Indeed, there are places where it doesnt take much of a leap of the imagination to believe that the 20th century hasnt happened. Great Saxham is one such place. You travel out of Bury westwards, past wealthy Westley and fat, comfortable Little Saxham with its gorgeous round-towered church. The roads narrow, and after another mile or so you turn up through a straight lane of rural council houses and bungalows. At the top of the lane, there is a gateway. It is probably late 19th century, but seems as archaic as if it was a survival of the Roman occupation. The gate has gone, but the solid stone posts that tower over the road narrow it, so that only one car can pass in each direction. It is the former main entrance to Saxham Hall, and beyond the gate you enter the park, cap in hand perhaps. Looking back, you can see now that the lane behind you is the former private drive to the Big House, obviously bought and built on by the local authority in the 1960s. It is easy to imagine it as it had once been. Beyond the gate is another world. The narrowed road skirts the park in a wide arc, with woods off to the right. Sheep turn to look once, then resumed their grazing. About a mile beyond the gate, there is a cluster of 19th century estate buildings, and among them, slightly set back from the road beyond an unusually high wall, was St Andrew. There was a lot of money here in the late 18th and early 19th centuries, so that you might even think it a Victorian building in local materials. But there is rather more to it than that. Farm buildings sit immediately against the graveyard, only yards from the church. When Mortlock came this way, he found chickens pottering about among the graves, and like me you may experience the unnervingly close neighing of a horse in the stables across from the porch. The great restoration of this church was at a most unusual date, 1798, fully fifty years before the great wave of sacramentalism rolled out of Oxford and swept across the Church of England. Because of this, it appears rather plain, although quite in keeping with its Perpendicular origins - no attempt was made to introduce the popular mock-classical features of the day. 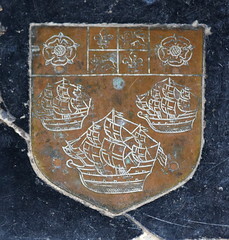 The patron of the parish at the time was Thomas Mills, more familiar from his ancestors at Framlingham than here. There was another makeover in the 1820s. 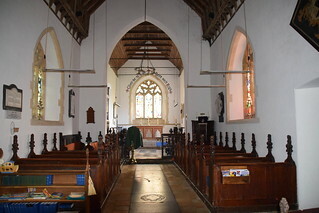 I've always found this church open, and so it should be, for it has a great treasure which cannot be stolen, but might easily be vandalised if the church was kept locked (I wish that someone would explain this to the churchwardens at Nowton). The careful restoration preserved the Norman doorways and 15th century font, and the church would be indistinguishable from hundreds of other neat, clean 19th century refurbishments if it were not for the fact that it contains some most unusual glass. 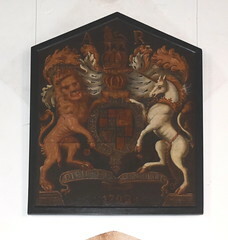 It was collected by Thomas Mills' son, William, and fills the east and west windows. It is mostly 17th century (you can see a date on one piece) and much of it is Swiss in origin. 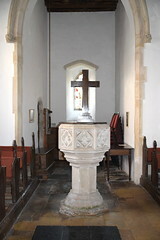 As at Nowton, it probably came from continental monasteries. The best is probably the small scale collection in the west window. This includes figures of St Mary Magdalene, St John the Baptist and the Blessed Virgin, as well as scenes of the Annunciation, the Coronation of the Queen of Heaven, the Vision of St John, and much more. The work in the east window is on a larger scale, some of it Flemish in origin. 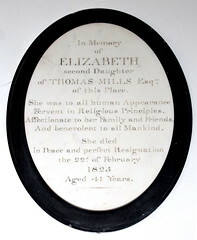 There are several simple and tasteful Mills memorials - but the Mills family was not the first famous dynasty to hold the Hall here. 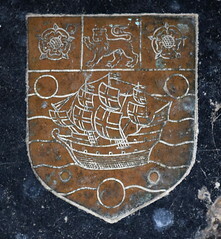 Back in the 16th and 17th centuries, it was the home of the Eldred family, famous explorers and circumnavigators of the globe. 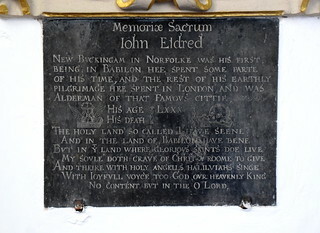 John Eldred died in 1632, and has one wall-mounted bust memorial on the south sanctuary wall, as well as a figure brass reset in the chancel floor from a lost table tomb. Both are gloriously flamboyant, and might seem quite out of kilter with that time, on the eve of the long Puritan night. Compare them, for instance, with the Boggas memorial at Flowton, barely ten years later. But, although the bust is of an elderly Elizabethan, I think that there is a 17th Century knowingness about them. 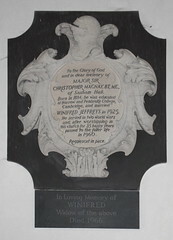 The inscription beneath the bust reads in part The Holy Land so called I have seene and in the land of Babilone have bene, but in thy land where glorious saints doe live my soule doth crave of Christ a room to give - curiously, the carver missed out the S in Christ, and had to add it in above. It might have been done in a hurry, but perhaps it is rather a Puritan sentiment after all, don't you think? 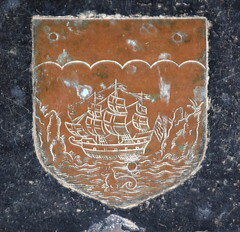 The brass has little shields with merchant ships on, one scurrying between cliffs and featuring a sea monster. 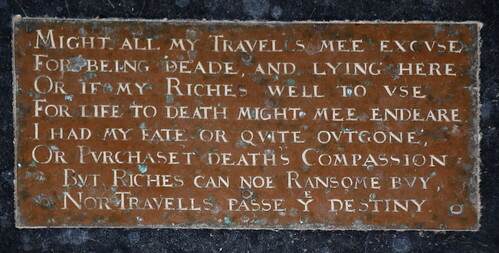 The inscription here is more reflective, asking for our tolerance: Might all my travells mee excuse for being deade, and lying here, for, as it concludes, but riches can noe ransome buy nor travells passe the destiny. 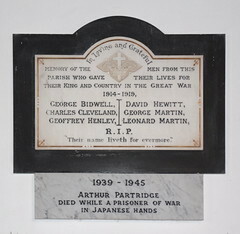 The First World War memorial remembers names of men who were estate workers here. And, after all, here is the English Church as it was on the eve of the First World War, triumphant, apparently eternal, at the very heart of the Age of Empires. Now, it is only to be found in backwaters like this, and the very fact that they are backwaters tells us that, really, it has not survived at all.